As in previous years, Denmark remained the country dominating Europe’s solar district heating market. Twenty of the 23 new and upgraded district heating plants in Europe above 350 kWth (500 m²) from the statistics compiled by Jan-Olof Dalenbäck from the Chalmers University of Technology, Sweden, went into operation in Denmark – whereas Austria, Italy and Sweden had only one each to show for. Dalenbäck’s database shows 211 large-scale district heating plants currently in operation, with combined output at 708 MW (1.01 million m²). This means that only every fourth district heating plant in Europe uses solar energy compared to the 5,400 district heating systems a database from Swedish Halmstad University lists from across the EU-27. The Swedish researcher also explained that there are different ways of feeding the heat into the network, something that also depends on the country. 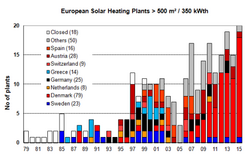 Read the complete news about solar district heating in Europe on solarthermalworld.org.